Saudi Arabian airline Nas Air, which was later re-branded as Flynas, operated 6 110 seat Embraer E190LRs and 4 118 seat Embraer E195s, but ceased operations of the regional jet a while ago, as the airline transitioned to an Airbus A320 fleet. Of the six E190s, all leased from GECAS, two aircraft, with manufacturer serial number (MSN) 217 and 233 were reportedly to be leased to Bengaluru based FLYeasy, which is yet to obtain its Air Operator Permit (AOP). Google Earth satellite imagery dated 15th September 2015 of the Jordan Aircraft Maintenance Company (JorAMCO) facility (see the highlighted portion in the image above) at the Queen Alia International Aiport at Jordan’s capital Ammam shows two Embraer E190 aircraft painted in what definitely appears as Flyeasy’s livery. Earlier satellite imagery dated 17th June 2015 shows one E190 in Nasair colors, and one E190 in Flyeasy’s colors parked at the JorAMCO facility. 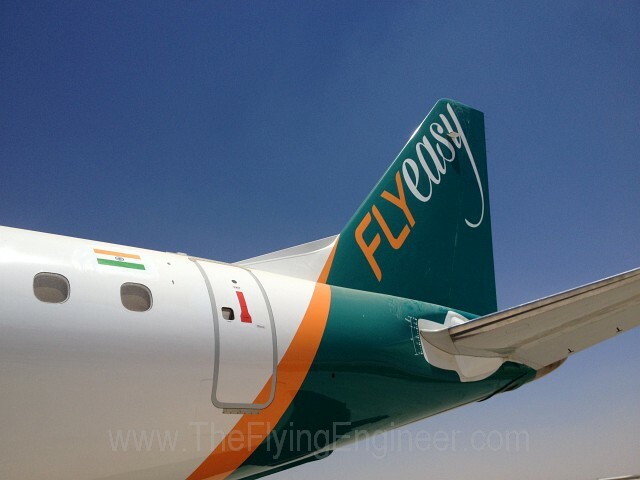 The Flyeasy livery is very evident in the images, with the dark green winglets, dark green engines, and the dark green paint that follows the vertical stabiliser down to the bottom of the fuselage. Air Costa’s 112 seat E190 registered VT-LBR, leased from GECAS, today flew into JorAMCO for scheduled maintenance. Below are zoomed in images of the aircraft, and below that the embedded map. Please click on the image to view in full resolution. 2015 is turning out to be the third boom in Indian civil aviation. The first was around 1995, when the sole aim was to start airlines. The second boom was in and around 2005 (ten years later), when low cost carriers were a fad. The third boom that hovers around 2015 (ten years after 2005), seems to be the birth of disruptive airlines. AirAsia India, Vistara, and a slew of regionals : Air Costa, Air Pegasus, Trujet, and Flyeasy. Mainline routes have saturated. The 180 seat jet has been used, and perhaps, abused. Many markets are still too small to have either a 180 seat jet deployed, or too long in distance to be flown by a turboprop. Turboprops cater to short and thin routes, while regional jets, such as the Embraer E-jets, Mitsubishi MRJ, the Bombardier CRJ series and the CSeries cater to long and thin routes. 180 seat single aisle jets are best suited to long and denser routes. With the saturation of the 180 seat market, the real gap left behind in India is the much needed inter-regional connectivity, mostly the long routes between Tier II, Tier III cities and Tier I cities. That is where the gap is, and Air Costa moved in to exercise a first mover advantage to tap that market. With Air Costa’s growth being slower than initially projected, and a market that is big enough with a high growth rate, Flyeasy seems to move in to tap the untapped market. Based on hiring drives on Flyeasy’s Facebook page, the airline may fly to Tiruchy, Bagdogra, Ranchi, Varanasi, Indore and Bhubaneshwar from Bangalore. The network is yet unknown at this stage, but considering a regional operating permit and its limitations, the airline may fly a point-to-point network between Bangalore and six stations. Sources reveal that the airline will be leasing two Embraer E190s from Flynas (formerly known as NASair). NASair had six Embraer E190s in its fleet, of which two have been transferred to Borajet and one to AnadoluJet of Turkey. Three other E190LRs seem to be in storage, of which 7 year olds MSN 217 and 233 are expected to join Flyeasy’s fleet, and presently are at Jordan undergoing ‘C’ checks. Both aircraft are powered by GE CF34-10E7 engines and are configured to seat 110 passengers each in a single class configuration. MSN 217 is out of the paint shop, in Flyeasy colors, and is expected to be flown into Bangalore this month. The aircraft may be registered with the VT-VVx series, with the first two aircraft expected to be registered VT-VVA and VT-VVB. Maintenance of the aircraft has been outsourced to Airworks. The airline apparently plans to launch operations with 3 aircraft, and grow the fleet to a total of 5 aircraft within the first 6 months of operations, and discussions with lessors for these aircraft are believed to be in advanced stages. The airline has ambitious plans to grow the fleet to 10 aircraft by July 2017, which seem a bit optimistic. The airline held a formal application meeting with the DGCA on the 6th of July, 2015. Considering that it takes around 90 days from the formal application meeting to receive the AOP, the airline may receive its AOP towards the end of September, or around early October 2015. This may make the airline open for sales around mid-October 2015, and start commercial operations towards the end of October or early November 2015. Fleet growth plans, when translated to dates, indicate a fleet of 5 aircraft by April 2016, and thereafter on average one aircraft every 3 months till July 2017, when the fleet size is expected to touch 10. However, AirAsia India, Air Pegasus, and Air Costa have shown that fleet projections tend to be over optimistic, and are seldom adhered to. The airline plans to induct airplanes through both operating and financing leases. The real promoters or the source(s) of funding are yet unknown, but the funding seems to be from the Middle East. It is uncertain if there exists foreign direct investment (FDI) or investments from non-resident Indians (NRI). The airline published the management bios of its 15 heads of departments on its website. Besides a CEO, the airline also has a deputy CEO, Lila Singh Aulakh, who formerly was the director of operations at Air Costa. Although Air Costa and Flyeasy operate the same aircraft type, the network of Air Costa and the possible destinations of Flyeasy do not overlap. Competition in this case is only notional, with both airlines having no true competitors at this stage. One very important observation about Flyeasy is the importance the airline gives to the organisational culture. The airline calls its employees a ‘family’. CEO Finn Thaulow, who spent a large part of his airline career with SAS, may have been inspired by Jan Carlzon, who was the CEO of the SAS group between 1981 – 1994. Jan Carlzon transformed SAS from a loss making European airline to a profitable one, by emphasising and cultivating a culture that motivated employees to deliver their best through a feeling of ownership and belonging. The business model, growth plans and the efficiency of the airline will however be put to test in the speed with which the AOP is secured, and the way in which the airline’s revenues and fleet grow. Customer satisfaction will be another key performance indicator. Airlines with discipline across departments are the most likely to succeed, just like market leader IndiGo, which has benefitted all three stakeholders: the board, employees, and passengers.